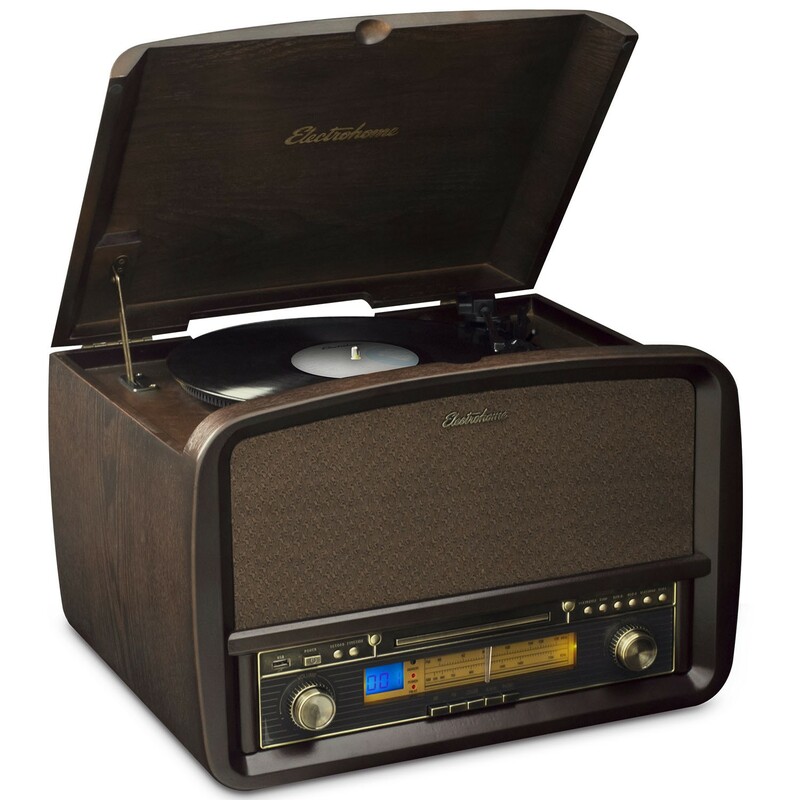 Backed by over 100 years of manufacturing high fidelity audio products, Electrohome has paired the design of vintage record players with the technology of modern music systems. 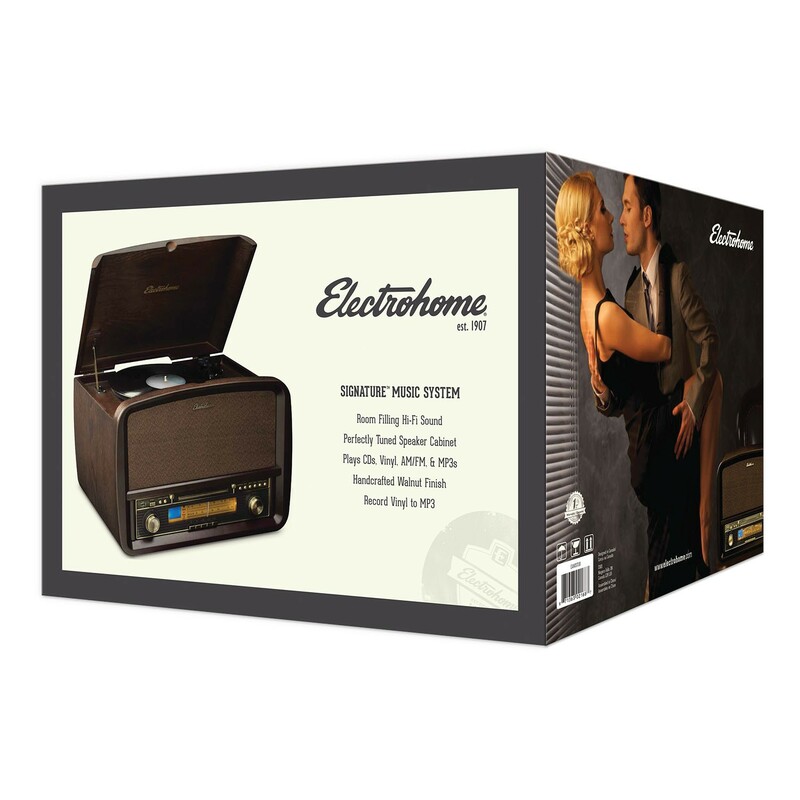 Music enthusiasts and casual listeners alike will enjoy an amazing audio journey with the Signature Retro Music System from Electrohome. Most people have music that lives in more than one place. 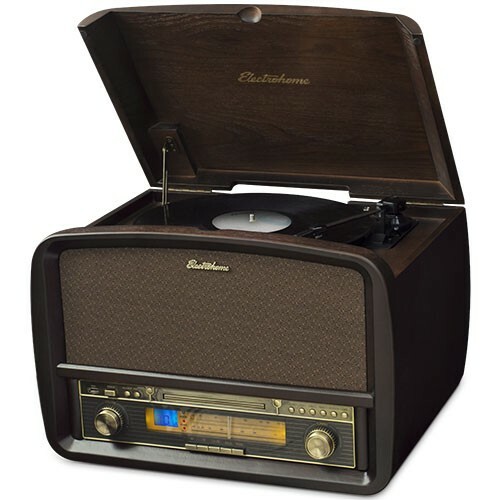 Whether it’s the warm tones of your favorite vinyl, AM/FM radio, MP3 music from your USB drive, CD, or listening to your smartphone music through the 3.5mm auxiliary input, the Signature Record Player offers a variety of ways to listen to music. The fully automatic belt-driven turntable spins 7, 10 and 12-inch records at three speeds of 331/3, 45 and 78 revolutions per minute, so you can rest assured knowing that your – and your dads - entire vinyl library can be enjoyed. Each cabinet is handcrafted with real wood and a rich walnut finish. Premium audio components such as the conical-shaped sapphire needle and tuned acoustic speaker chambers inside the unit give the Signature Music System room filling sound that creates a warm and crisp listening experience. With the natural sound of vinyl, and four high-performance speakers, you’ll hear details that you’ve never heard before. 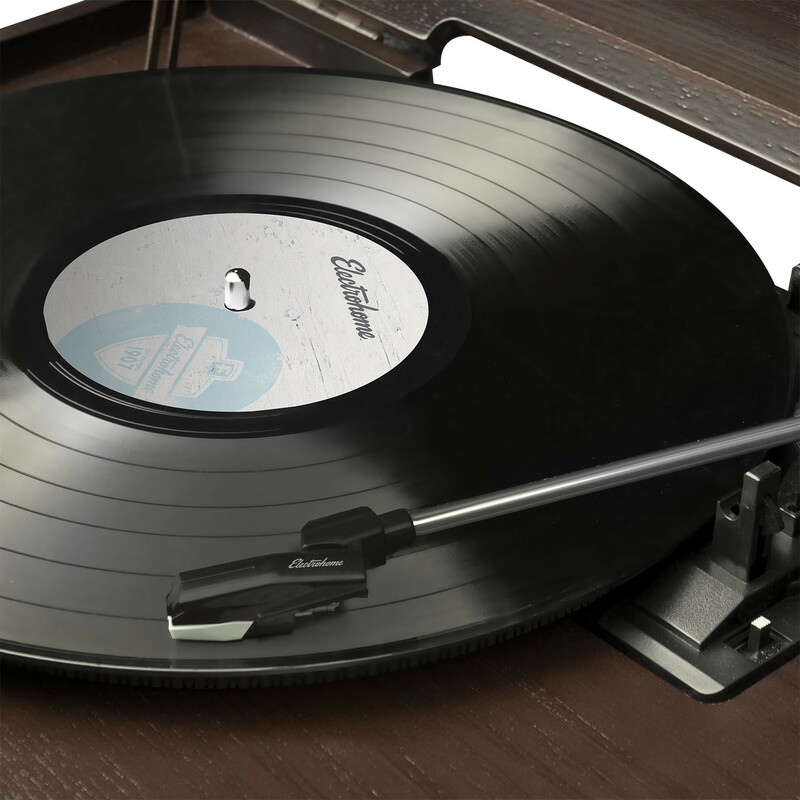 This versatile system lets you record your favorite vinyl music so that you can listen to it on other music players. With a built-in MP3 encoder it will convert and transfer your vinyl albums to a USB storage device in MP3 format without the use of a computer. The old-fashioned look will match any décor and make a great addition to any home. Fine details like the amber lighting on the analog tuning dial, rotary control knob and antiqued patina faceplate personifies a truly classic system. A beauty, nice for casual use. Nice and solid, like a small piece of furniture. The turntable seems a little light weight and plasticky, but I figure as long as I keep the records clean, and replace the stylus as needed, it will be fine. I have played only one record on it so far, and it was satisfactory. The radio and CD system sound good. I had a component system back in the 80s, and it is not fair to compare this to a component system. For me, it is beautiful to look at, and for casual use, decent to listen to. So far, I love it! Electrohome lives up to its name. Had a few minor issues that were promptly responded to by customer support. Response to my issues were handled swiftly and politely. A replacement was shipped to us in an expeditious manner without question. Tried the new player and it functioned perfectly as the reviews I had read had said. Glad to have done business with this company. Great product. Don't look any further. This is the real deal! This thing is awesome! First record player I’ve ever owned and I hope it’s the last. Love the classic look and the quality sound. Would definitely recommend to anyone! I am truly pleased with the overall look and performance of our record player. Rich sound and beautiful cabinet. The only comment I would make is that the function buttons are somewhat hard to see, but that is not a big problem. 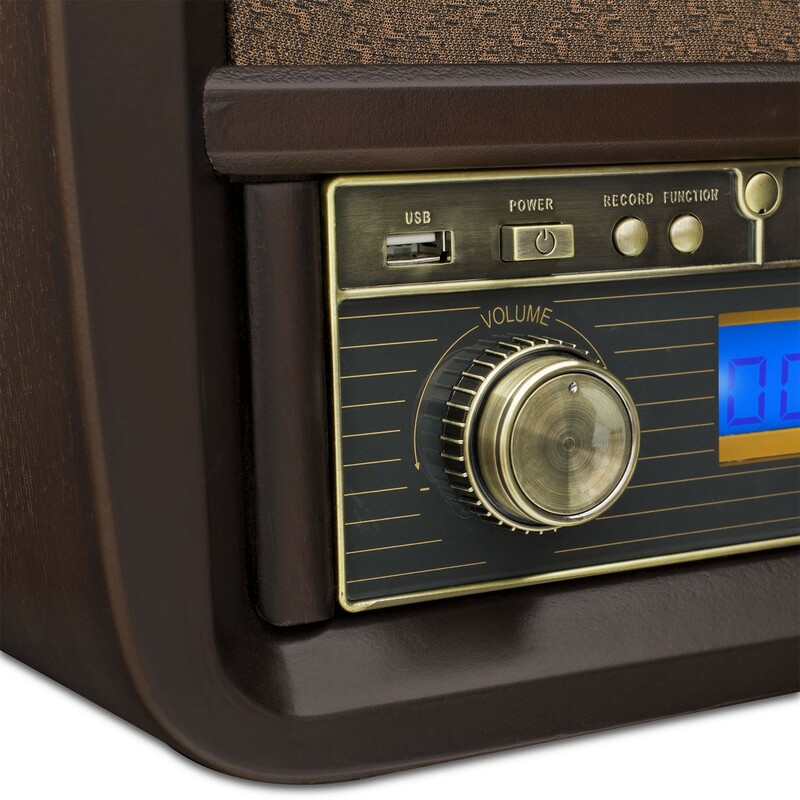 Love it until one day radio just stopped working. No sound at all! The record players is great. The sound is terrific. I love all the speakers. Like probably everyone else, I wanted an all in one record player with good sound - and it surpassed my expectations. I finally got around to trying the CD player, and it looks like is says NOd, it can't find or read the CD. Will contact customer support soon. I really don't want to part with the record player to get the CD player corrected. I haven't tried the USB port, I hope that works. Great unit high quality device! Excelent finish well packed all pieces aligned in this unit. Great quality on CD MP3 Radio record player with bass loss if you want excelent sound results with turntable you shall choose other products. I'm putting to turn my old vynils last heard when I was a teenager feels great to remember even with lower quality. I also purchased a 'Mpow' bluetooth adapter for aux entry. Just pluged on the back of the device and it's bluettoth enabled great sound quality as well. Stopped Working all of a Sudden!! I have to say I've been contemplating whether to buy an all-in-one record player for some time. But I'm glad I finally did. I bought my Mom a Crosley 5-in-1 years back and she loved it. At that time I was wondering who wants to listen to records anymore. I'm a huge fan of high quality sound so CDs are the way to go. Records and cassettes degrade with time and use. So a retro record player although nostalgic did not merit buying one for me. I do have a lot of nice memories of being around a record player with my siblings and dancing to records. So records do hold sentimental value for me. As the world becomes more digital I started to miss the 'good ol' analog equipment of the past. There is something about it that I feel is missing from digital devices. So records has some appeal to me because of this. Recently I was looking for an old record that was transferred to CD but I can no longer find. I was able to find the original record and a cassette transfer. So this brought back the subject of getting a record player. I did some research and most recommend getting a record player and using a receiver etc. I do have a pretty good system but I wanted something easy to use and that looks like a record player of the past. Something with some aesthetic of those times that I remember with that had the 'good ol'' sound. After much research I came across this system. Some hate it saying its an inferior 'Made In China' unit while others praise it. I decided to take a chance and I'm really glad I did. I love it! 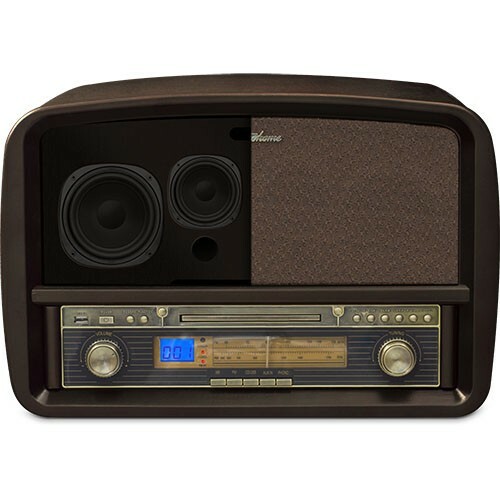 It looks good it's easy to use it sounds sharp and retro and it plays records very well! And best of all it brought me back to those days when I huddle around the record player with my siblings. The days were music was simply just music. This unit is missing a cassette player which I thought was strange since Crosley and all the other similar units bring one. But then again when I think about it records have been around for almost 100 years. It out lived other methods of recording. 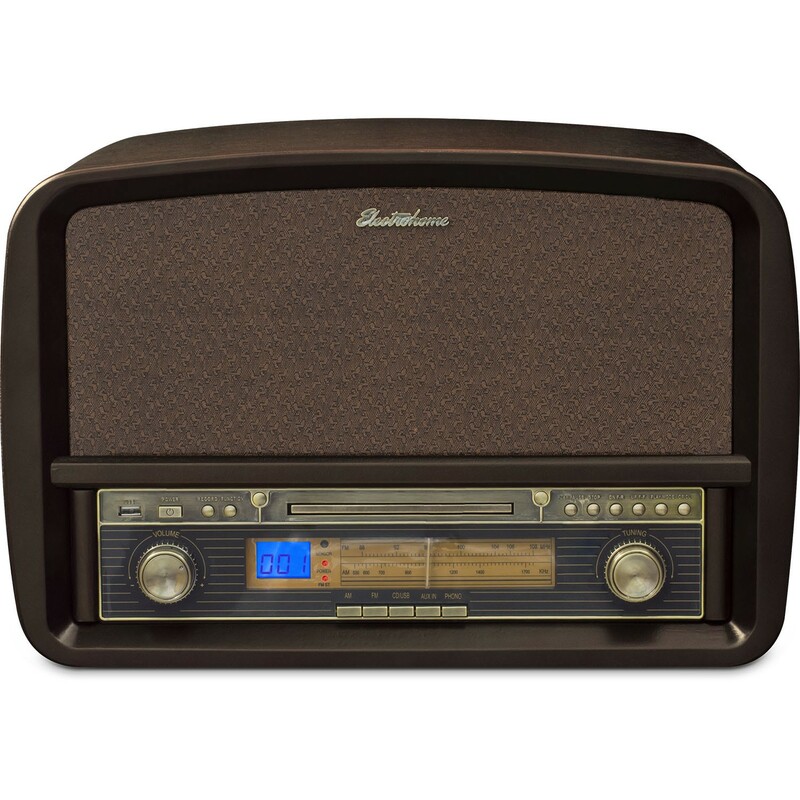 Radio has been around for over 100 years. And CDs will last over 100 years... So I guess cassettes did not fall in the 100 years category? The unit does provide mp3 transfer of records and CDs which is nice. It also has an AUX jack for devices. It does not have Bluetooth which is fine with me. 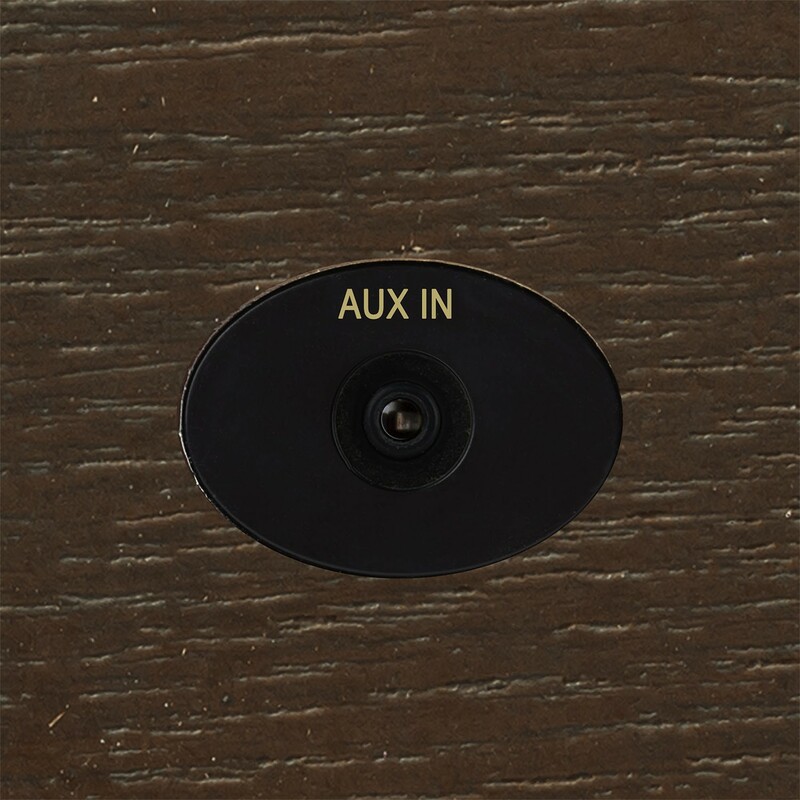 There are really cheap Bluetooth receivers that hook up to AUX jack if you really want it. 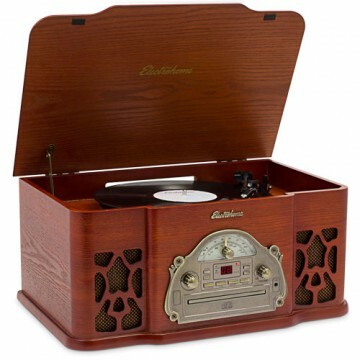 The record player has 3 speeds which is great. Radio is pretty good. CDs play like CDs do. There is a remote but like I said I tend to huddle around the record player.